Java archives are simple ZIP files with some extra resources containing meta-data about the archive, signatures, services, and many more. While application archives often can be executed directly, library JAR files are normally not executable. A double-click on the archive item in Windows Explorer simply does nothing as it seems. Indeed, library archive normally do not have any main class defined which could be exectuted. In some situations developers like to have fast access to library archive files without having to open a ZIP tool like WinZIP. And this is where the JAR file extension (aka JarInfo) comes into play. This extension provides a configurable main class to be added to JAR library files. Once added, a simple double-click on the archives executes the extension which provides a simple window showing the most interesting parts of the archives. If configured, the files and folders found in the archive may be extracted straight from here. 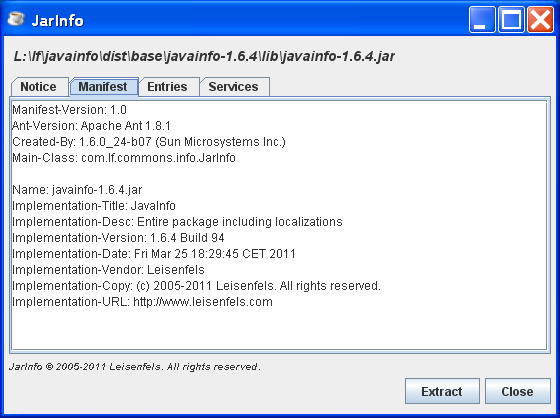 As the screenshot shows the JarInfo component currently supports the tabs Notice, Manifest, Entries, and Services. The Notice shows an arbitrary plain or HTML text including images. The Manifest tab shows the contents of the MANIFEST.MF file found in JAR archives (may be missing for other ZIP files). The Entries tab lists the files and folders contained in the JAR archive. Last but not least the Services tab shows the services provided by the archive. This may be localizations, drivers, plugins etc. The way these pieces of information are presented to the user may be configured with a single resource file jarinfo.properties. Please read the more detailed tutorial on how to use the JAR file extension. Implementation-Copy: (c) 2005-2011 Leisenfels. All rights reserved.